Fiberglass tanks are built to last. FTPI's member tanks are designed with the latest technologies and manufactured under the strictest industry guidelines to meet a variety of needs. 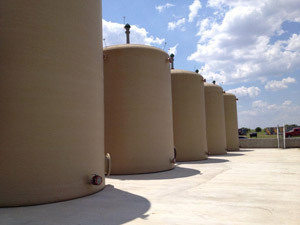 Using advanced technology for fiberglass production, FRP tanks offer reliability, corrosion resistance and advanced engineering designs for both aboveground and belowground storage tanks. UL Listed single-wall and double-wall construction are available for many industries. Double-wall tanks can accommodate a wide array of high-tech electronic leak monitoring and stored product control equipment. 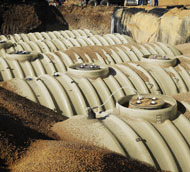 FRP Underground Tank sizes range from 285 to 50,000 gallons in capacity, and from 4 to 12 feet in diameter and 6-1/2 to 73 feet in length. FRP Shop Fabricated Aboveground Tank sizes range from 40 to 60,000 gallons in capacity. Field erected sizes are larger.